Caribous (Rangifer tarandus), which are also frequently known as reindeer, are hoofed mammals that hail from northern regions of Europe, Asia and North America. They often live, for example, in parts of Canada, the United States, Mongolia and Norway. The sizable deer are classic herbivores, and their foods slightly change along with the seasons. As far as the deer world goes, caribous are mid-sized creatures. They usually weigh between 240 and 700 pounds, and the males are bigger than the females, although not by a lot. Measuring from the shoulder region, caribous are usually between 4 and 5 feet in height. Both genders possess antlers, although those of the males are markedly larger. Some caribous are white in coloration, while others are a much darker deep brown. Preferred habitats for the migratory species are woodland, taiga and tundra settings. 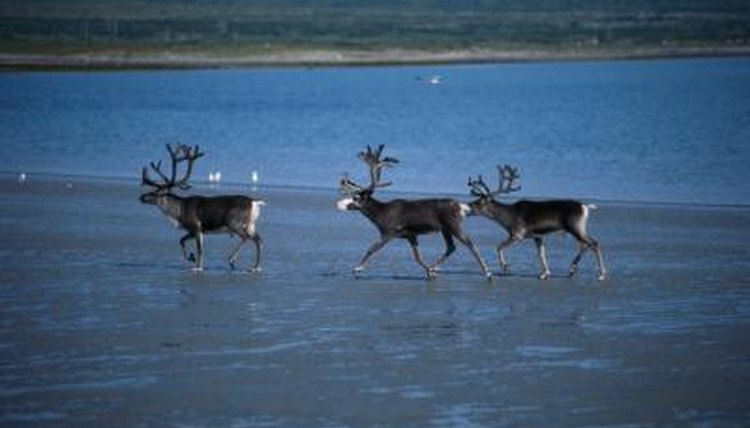 Caribous exist in both domestic and wild forms. When compared to their domestic counterparts, caribous that live out in nature tend to have longer limbs and lighter bodies, weight-wise. Caribous are, for the most part, grazers. In the warmer summer months, however, caribous tend to dine on much broader assortments of sustenance. In the summertime they're big on the foliage of both birch and willow trees. Other summer staples for caribous, apart from grass, are sedges, flowers, mushrooms and shrubs. In times like these when food is plentiful, caribous often handily eat roughly 12 pounds of food on a daily basis. Other typical elements of their diet are both ferns and herbs. In the cold and tougher winter months, the bulk of the caribou diet consists of lichens, which are often available in their forest environments. Caribous feed both on arboreal and terrestrial lichen varieties. They employ their hooves to eliminate all remnants of snow from energy-packed lichens. Access to food during the snowy winter can lead to rivalry between caribous, which could be why all individuals are equipped with antlers. Caribous also feed on lots of fungi and mosses in the wintertime. Caribous that reside in captivity -- think zoos -- often consume herbivorous blends that come in pellet form. They also frequently dine on alfalfa hay and grains that are designed for reindeer consumption. What Kind of Animals in the Tundra Eat Lichens? What Kind of Habitat Does a Bighorn Sheep Live In? What Does a Walaroo Eat? What Does the African Wildebeest Eat? What Do Grizzily Bears Eat?